Many people stated that the midsole unit of the Nike Zoom Fly Flyknit was highly responsive to their movements. The carbon fiber plate integrated into the midsole gained some fans as it apparently helped in making each step as springy as possible. The Flyknit upper was considered by most consumers as one of the best cover systems in the market because it secured the foot in a lightweight and breathable wrap. Several runners were happy that this shoe accommodated their sizing expectations. Purchasers have lauded the aesthetics of the Nike Zoom Fly Flyknit, stating that its looks were visually striking. This shoe just felt fast, according to more than a handful of users. Some people complained that the outsole unit already started to wear off after only a few uses. Several individuals noted that this shoe’s profile was heavy for their tastes, emphasizing that it didn’t allow them to wear it for very long. The removable nature of the insole caused it to shift around irritatingly, a few testers observed. The collar tended to rub against the ankles, causing discomfort, according to some consumers. The Nike Zoom Fly Flyknit offered a lot when it comes to responsive performance on the roads. People were generally happy with the touted younger brother of the Vaporfly 4%. They welcomed the fresh looks, the fast heel-to-transitions, the high-quality midsole, and the breathable Flyknit upper. On the other hand, there were those who complained that the weight of this road shoe was more substantial than they anticipated; others weren’t happy with the easy-to-wear-off outsole and the way the collar chafed the ankles irritatingly. The Zoom Fly Flyknit offers much of the technology of the Vapor Fly 4% without the hefty £250 price tag. It's sock-like upper provides an extremely comfortable fit, and the shoe encourages a fast, fluid pace. The Zoom Fly Flyknit has cemented itself as my first choice for fast training and racing. Before beginning this review, I feel that I should confess that I’ve never run in a Nike shoe. It’s not that I’ve had anything against Nike; I’ve read the hype, seen the die-hard Nike addicts swear allegiance to their manufacturer-of-choice and the despair of those trying desperately to secure a pair of Vaporfly 4% shoes each time Nike release another batch. I’ve generally found however that a combination of New Balance and Brooks suit me well for road running, with Inov8 delivering everything I need off-road. Despite this, I really felt that I should try a pair of Nike running shoes, and then I saw the release of the Zoom Fly Flyknit. This is the second version of Nike’s Zoom Fly – a kind of "affordable" version of the Vaporfly 4% which now incorporates the same full-length carbon-fiber plate that was instrumental in the 2017 sub-2 hour marathon attempt. I figured that it was time to give them a go. I have to hand it to Nike the Zoom Fly FK looks like a fantastically fast shoe. One you also know you could happily combine with a pair of jeans or casual shorts should you wish. Taking it out of the box, I couldn’t help admiring the streamlined look of the shoe right down to the way that the midsole is formed to a point at the back of the shoe. The upper looks and feels great, and even the "Nike Racing" branded insole and aglets are designed to inspire a "let’s go out and do this feeling." Nike offers the Zoom Fly FK in a range colorways including an aptly named "Bright Crimson" which appears more like an orange, and a "Blue Orbit." Each of which will help you make a visual statement that will see you stand out from the pack unless you happen to be at the front end of one of the marathon majors when most of the elite field are often sporting bright orange Vapor Fly shoes! I chose the rather understated Black/White/Gunsmoke colorway and was immediately impressed with the shoe. In reality, I’m sure that it’ll come as no surprise that Nike has once again designed a great looking shoe. The Zoom Fly Flyknit is listed as 238g (8.7oz). This certainly isn’t as light as the premium end Vaporfly 4% which comes in at 184g, or similar racing shoes such as 1400v6 Racing Shoe at 204g. The key, however, is that I don’t feel that this is a shoe that stays in its box until race day, but rather one that can be used for more regular tempo and fast training sessions. And so, it compares favorably to other light training shoes such as the Fresh Foam Zante v4 at 244g. As expected, my UK 13.5 (US14) shoe weighed in heavier than the standard shoe, at 335g. I don’t have a picture of the shoe sitting on a pair of scales, so you’ll need to use your imagination. In the case of the Zoom Fly Flyknit, in consideration of the weight of the shoe, one must take into account the overall way in which the shoe works. This will be considered further below. But how the carbon fiber plate works to help propel you forward certainly outweighs the effect of a few extra grams of weight. The heel stack is 33mm with a forefoot height of 23mm, providing a heel to toe drop on this shoe of 10mm. The Zoom Fly Flyknit fits true-to-size. In my case, that’s a UK 13 (US 14) which is the same size I’d wear in Brooks, Inov-8, and ASICS. For reference, I’d tend towards a ½ UK size larger in New Balance shoes, as well as Hoka and Salomon. US readers, please note that despite the variation in sizing across manufacturers, I almost always require a US 14 / EU 49. It’s quite possible that the differences in sizes, therefore, are due to conversions from US to UK sizing. Aside from the sizing, the Zoom Fly Flyknit fits uniquely, certainly with respect to any running shoes I’ve worn before. When I initially picked up the shoe, the Flyknit upper felt very thin and light, and I anticipated that the shoe would feel loose, and expected that I’d have to tie it tight. Putting the shoe on, I found that tongue is formed from an elasticated mesh which serves to hold the upper snug around the foot, whilst an elasticated section at the top of the heel cup provides a similar role around the ankle. Many manufacturers claim a "bootie-like construction," but this shoe is almost sock-like in its fit and the way it wraps around the foot seamlessly. I’d be inclined to think that the shoe could be worn without laces such is the manner in which the tongue works to hold the foot. Indeed, the way the lace loops are formed from the Flyknit upper means that it is difficult to pull the laces through to tighten. As such, I didn’t worry about tying the laces too tight, and instead allowed the tongue and the mesh upper work together to hold the foot. In summary, I’d agree with Nike’s claim that the "Flyknit upper delivers ultra-lightweight support that fits like a glove." The Flyknit upper is essentially a single piece of knitted engineered mesh, in which the density of knit and elasticity of the mesh varies in different parts of the upper to provide breathability, flexibility and hold just where you need it. More than any other running shoe I’ve worn, putting on the Zoom Fly Flyknit feels more like pulling on a sock that stepping into a shoe. Nike themselves explain that "fusible yarns create zones of structure and support without adding weight." There’s certainly no overlays other than the Nike swoosh, and there are no seams within the upper: as described above, the tongue is seamlessly knitted into the rest of the shoe. At front of the shoe, there’s no toe bumper to speak of except where the outsole rolls over the front of the upper. 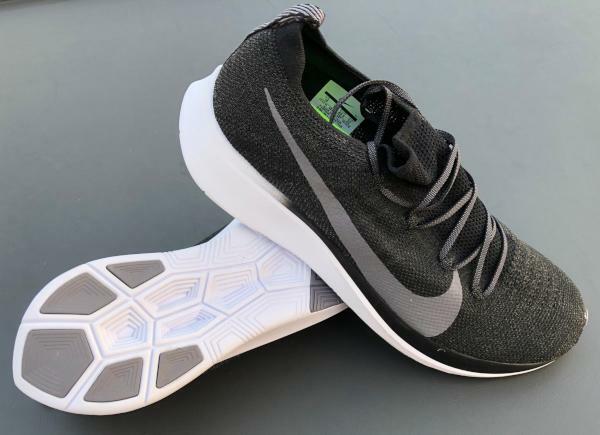 There is no rigid heel counter, though a felt-like liner is glued inside the Flyknit, which also incorporates a small section of padding where the cup wraps around the Achilles. The result is an extremely comfortable breathable sock-like upper which holds the foot naturally and which inside which I’d be more than happy to run without socks. The midsole of the Zoom Fly Flyknit comprises of the same full-length carbon-fiber plate as the Vaporfly, sandwiched between Nike’s React foam. This React foam replaces the lighter, and somewhat more responsive, Zoom X foam used in the Vaporfly. Other than that, the depth of midsole and drop are very similar across the two models of shoe. Nike explains that their React foam was developed to provide the desired absorption and cushioning at the same time delivering energy return 13% greater than its forerunner Lunarlon foam which was incorporated into the original Zoom Fly shoe (with a plastic plate). Without extensive testing facilities at my disposal, I can’t really confirm these claims except with the running equivalent of a car buyer "kicking the tyres" pressing in the midsole of the shoe it certainly feels firm, yet cushioned. There’s no doubt that the foam very quickly and forcefully returns to its original shape once released. The carbon-fiber plate means that the shoe doesn’t have the same flexibility as other shoes; there’s no point trying to bend the front of the shoe as the plate just won’t let you. Amongst other things, the carbon-fiber plate prevents the toes from bending to begin the spring off and instead encourages the foot to rock forward. The effect of this is discussed within the "performance" section below. The outsole of the Zoom Fly Flyknit has been tried-and-tested in the original Zoom Fly and the various iterations of the Vapor Fly shoe. The heel section incorporates five sections of high-abrasion rubber to protect the React foam, while the entire forefoot section of the outsole is made of foam rubber. While this will similarly protect the midsole, it also provides greater traction and adds a little more cushioning and spring to forefoot landings and take-off. To date, I’ve run approximately 100 miles in these shoes, and there is very little wear to the shoe. I do have a tendency to brush the outside of my heel as I land, and on the photo, you will see a little wearing to the React foam where this occurs. For me, this tends to occur in any shoe with an exposed foam sole, and I usually remedy this with the application of a little Shoe Goo. In any case, this is unlikely to affect the durability of the shoes. What is difficult to determine is the durability of the carbon-fiber plate. 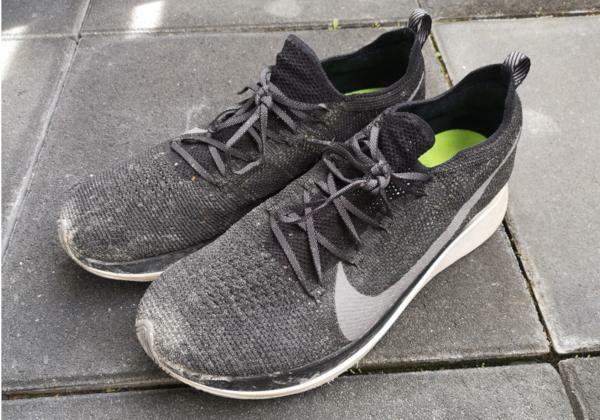 I certainly haven’t experienced any degradation in its performance to date, though there is anecdotal evidence of the plate in the Zoom Fly shoe having a limited lifespan. As a mid-pack runner, I would expect to run these shoes for at least 500km, though at this stage I can’t say how much more I’ll get from these shoes. Running shoes are highly personal, and so my experience of shoe performance should always be balanced against my own characteristics. As mentioned above, I’m more of a mid-pack runner at 48, 6’2” and currently around 87kg (190lbs), running 50-60 miles pw. My road running goals for this year are to achieve a sub 3:10 marathon and a sub 19’ 5k. My view of the performance of these shoes should, therefore, be balanced against my own level of performance. As mentioned at the top of the review, I haven’t previously run in a Nike shoe. As such, I can’t compare these to the previous version of the Zoom Fly, nor the shoe’s older (and more expensive) brother, the Vapor Fly. The first time laced them up and walked to where I’d begin to run; I immediately began to understand the difference that the carbon-fiber plate makes. Even as I walked, I found myself being rocked forward into the next step. The stiffness of the sole/plate means that instead of waiting for the toes to bend and the calf to contract to begin the push off, the plate causes the foot to rock forward into the next step. And at this stage, I was just walking! I’d initially planned an easy run to try out the shoes, but it soon became evident that these shoes are not designed for easy running. I tend to find myself running in a more upright position at slower paces, but in the Zoom Fly Flyknit, found myself being propelled forward. As a result of this, I naturally increased my pace and whilst I can’t claim that a faster pace was any easier, I certainly felt encouraged to run more quickly! It is difficult to explain the difference between these and more traditional shoes to anyone who has not worn a shoe with this type of plate. As the foot lands, it feels as if the carbon-fiber plate "rocks" the foot forward through a quick transition and a feeling of “spring off” into the next stride. Since then, I’ve used these shoes primarily for faster training sessions, both tempo and interval, and for a recent half-marathon race. I’ve found that the shoe performs exceptionally well in these situations. During fast sessions, the shoe delivers a stable, cushioned landing followed by a fast transition and a springy push off. It’s easy to get up to speed in the Zoom Fly Flyknit, and I have to agree with Nike’s marketing that the shoe provides a "smooth, responsive ride." During these longer races, the shoe seems to make it easier to maintain a fluid stride even as fatigue sets in towards the end of the race. I’m looking forward to wearing them for my next road marathon later this year. It should be noted that these shoes offer no structural support, and so are designed purely for the neutral runner. Nike is currently marketing these shoes under the tagline "Beyond your Fastest" and I’d love to be able to claim that the Zoom Fly Flyknit has helped me to achieve a handful of personal bests. Unfortunately, that hasn’t been the case in the short time I’ve been wearing these shoes, but I’m living in hope! In terms of performance, I am really enjoying having the Zoom Fly Flyknit in my rotation, and it has become my go-to shoe for fast training sessions and races. In that sense, it has replaced my previous choices, the New Balance Fresh Foam Beacon and Zante v4, although fortunately, the versatility of these shoes means that they will continue to find a use for other sessions. For many, the Zoom Fly Flyknit will be seen as a lower cost alternative to the Vapor Fly. Whilst the shoes share some of the same technology, the Vapor Fly retails at £250 (when you can get one) whilst the Zoom Fly Flyknit is widely available at the time of writing for less than £100. At that price, I’m sure that I won’t be the only one to decide that I’m more than happy with my Zoom Fly Flyknit! Furthermore, I’m confident that the lower price point and the differences in design make this a shoe for fast-paced training sessions as well as races. On top of the performance aspect of the shoe, I’ll finish with the fact that this is a great looking shoe which fits like a glove and will find plenty of use casually once it’s been retired from running. The Nike Zoom Fly Flyknit is the long-awaited update of the Nike Zoom Fly. Both shoes are the cheaper variants of the Nike Vaporfly 4% (Flyknit) edition. The update includes a full-length carbon plate, also used in the Vaporfly, in the midsole instead of a nylon fiber plate in the former version of the shoe. As the name already tells you, the Flyknit system is used for the upper material which shall provide an improved fitting on the foot. As foam, the Nike React is used which is quite soft and doesn't provide as much energy return as the ZoomX (used in the Vaporfly 4%) but provides longer durability claimed by Nike. The weight of the shoe is mid-range at 290 grams for size US 11,5. Nike recommends to wear this shoe in competitions and speed training session. I also really like the colorways and decent style of the shoes which Nike offers here. In the beginning, I used them for my speed workouts such as 400m & 1000m interval training or steady state tempo runs at around 3:40 min/km. Nowadays, I take them for easy runs or long runs with moderate pacing. From my point of view, they are a bit too soft at high speeds, and I'm missing the direct ground contact or furthermore, the last kick off the ground due to the cushioning of the Nike React foam. Nevertheless, as mentioned for easy workouts, they are just perfect for me. My pace during this training is at 4:30 min/km up to 5:30 min/km. Due to the Flyknit upper, the shoe really feels like a sock on your feet, very comfortable. Till now, I never had blisters or skin irritation, and I often choose just normal socks for running. The Flyknit is quite thin which feels good when running at hot conditions. When running at cold weather conditions at around 0°C, the material is too thin, and the feet get cold. The toe box provides enough space for normal feet size. As mentioned at the beginning of the review, the Nike React foam is used. This results in a very soft feeling when running. From energy return point of view, the foam is the second best provided by Nike. The best one is the ZoomX foam which is only used at the Vaporfly 4% and Pegasus Turbo model today. Additionally, the built-in carbon plate provides a nice touch off the ground. After using them for 450km, the cushioning still feels like new, and there is also no significant wear out of the outsole. I often used them during this winter, and even under wet conditions, I had enough grip when running around corners on the street. The Flyknit upper also seems to be fine without any damage so far. Typically I use running shoes up to 800-1000km before I sort them out and I guess this one will also land in this category of durability. Overall, I'm quite satisfied with the durability performance today. In contrast to what Nike suggest, using them in races and speed training, I use them in easy workouts. For races, I use shoes like the Adidas Adizero Takumi Sen 3 or the Adidas Adizero Adios Boost 3. Both shoes are a little bit lighter and providing more ground contact feeling from my point of view. Overall the shoe is quite comfortable, and I can recommend them as an everyday trainer when pacing at around 4:00 min/km up to 5:30 min/km. The price is high, but Nike is turning into the only major player in this elite marathoner shoe category and they can command such a price because their shoes are that good. The Nike Zoom Fly Flyknit is an amazing pair of running shoes with fantastic energy return to beat your personal best timing during race day. The Nike Zoom Fly Flyknit is a running shoe that’s designed to accommodate neutral pronation. It is considered by many to be the little brother of the highly regarded Zoom Vaporfly 4% Flyknit running shoe from 2018. The difference between the Zoom Fly Flyknit and its older brother lies in the midsole, as this new product features the widely popular React foam, with its responsive and shock-attenuating nature aiming to make each step as reactive as possible. The upper unit of the Nike Zoom Fly Flyknit is made up of the Flyknit Bootie, a one-piece wrapping system that evokes the feeling of being wrapped by a cloth. It is flexible and breathable, and it conforms to the shape of the foot as it bends and swells throughout the running session. The Nike Zoom Fly Flyknit was designed to be true to size. Runners can choose a pair using their usual sizing expectations. When it comes to width, the available options are D – Medium for men and B – Medium for women. The semi-curved shape of this shoe mimics the natural outline of the human foot. The heel portion of the Nike Zoom Fly Flyknit’s outsole is made up of a high-abrasion rubber. This compound’s purpose is to protect the midsole from the abrasive nature of the surfaces. It also provides traction as it is an inherent quality of rubber. Foam rubber is used in the forefoot section. This layer is as traction-ready as its heel counterpart, but it’s also spongy and flexible. It could potentially add a bit more cushioning and spring, making each foot landing and liftoff as agreeable as can be. The entire surface of the external pad features a polygonal traction pattern to heighten the shoe’s grip on the asphalt. The shallow grooves that trace these shapes serve as flex-points to encourage the natural bending of the foot. The React is Nike’s top-tier proprietary foam technology. It is meant to be an answer to other companies’ cushioning technologies. This full-length foam has a responsive build that aims to strengthen each toe off and mitigate the landings. It has a somewhat substantial thickness that may agree with those who like to have intense running sessions. A carbon plate is placed in the main React unit, reinforcing its entire surface. Its job is to help in gearing the foot towards an energized toe-off. It bends with the motion of the foot, then springs back into place when pressure is removed, thus giving the invigorated experience. An insole is added to put some cushioning for the underfoot. This add-on can be removed or replaced with a new insert of the wearer’s choosing. Flyknit is the material that’s used for the upper unit of the Nike Zoom Fly Flyknit. This material is likened to woven cloth, with a stretchy and airy build that’s reminiscent of socks. Runners can wear this running shoe without actual socks and still feel supported throughout the activity. A one-piece opening allows runners to experience a consistent and all-encompassing wrap. The absence of the tongue unit lessens the risk of hot spots or material bunching. A ghillie lacing system with flat laces and discreet eyelets helps to adjust the in-shoe fit without causing any strain on the instep. Nike Swoosh logos are printed on the sides of the Zoom Fly Flyknit. These thin prints are meant to heighten brand recognition and help the rest of the upper when it comes to keeping the foot in place. A pull tab on the heel part opens up the one-piece upper, allowing the foot to enter or exit the foot-chamber with ease. It also doubles as a hanging loop for when there’s a need to store the shoe on a hook or hanger.